Mundane subjects have been depicted in paintings before the impressionists came, notable from 17th century Dutch painters like Rembrandt and Jan Steen. But they were composed in the classical compositional style where the main subject was the focus, often in contrived positions to command attention. On the other hand, impressionists throw out this artificiality between subject and background, often depicting something like a photographic stolen shot that creates a more relaxed and natural contextual positioning of the main subject. In short, impressionism is a depiction of an artist’s impression. It does not aim to be accurate in detail which one finds in the realist and neo-realist style. But the impression often elicits a stronger emotional appeal which is variously triggered in the beholder. Many impressionist paintings have a soft nebulous rendering of its subject, almost dream-like. Rules about perspective, clean definite lines and interplay of light and shadows no longer apply. It is a spontaneous expression, often discarding the basic ability to draw correctly and becomes more an interplay of colors. Because it is an impression, every impressionist painting becomes more an expression of the heart. You have read through the world of the Impressionists and explored some of the major themes that unite the artists and their work. Now have another look at two of the paintings below. At first glance they seem quite different from one another, but in their own way each one is typical of Impressionism. Can you think why? The Impressionists liked to paint scenes of everyday life, of contemporary people at work and play. Caillebotte has painted a moment of everyday life from the world he knew. A middle class man and woman stroll along the bridge, and working class man pauses to gaze onto the train tracks. A dog trots by as if by accident. Here a group of people seem to be enjoying the spring in groves of trees. The Impressionists shared a fascination with the countryside as a result of the growth of a Parisian middle-class, with leisure time and the arrival of the railroad system giving them access to travel outside the confines of the city. The Impressionist world was a contrast of city and country, and these were the locales they painted. Here you see elements of the dynamic, modern Paris the Impressionists loved to paint. The focus is the famous bridge of Europe – built in 1865 to 1868 – a technological wonder of its day. Other elements of the new city include a wide boulevard and the steam of a train from the tracks below the bridge. Sisley focused on the riverside villages outside Paris, painting landscape to explore nature’s colors and the effects of sunlight in the outdoor environment. Many Impressionists chose to work spontaneously and quickly, more concerned with capturing a passing moment than with near brushwork. Although Caillebotte often chose outdoors subjects and made preliminary studies outside, he finished his paintings in the studio. 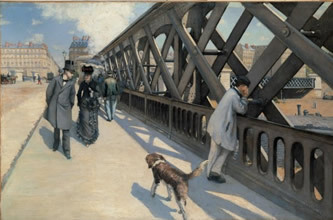 Caillebotte’s idea of capturing the moment was by freezing it in a camera frame, a composition calculated and studied to create the illusion of the passing moment. Sisley’s painting demonstrated the exuberant brushwork that is a hallmark of plein air painting. His work is much smaller than Caillebotte’s – roughly two-and-a-half feet wide. 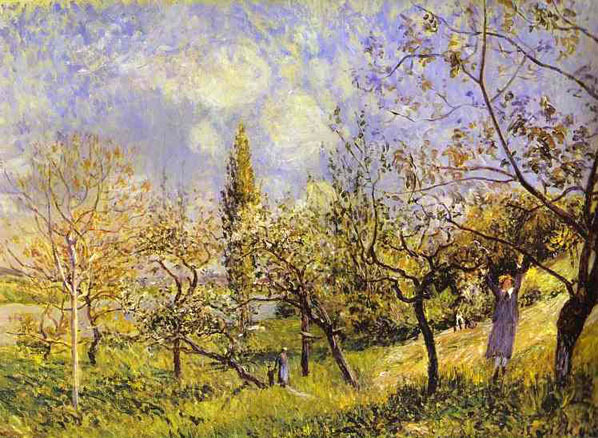 Sisley captured the passing moment almost literally by completing his work in a few settings. The influence of photography is apparent in the steep perspective and seemingly casual placement of figures in this composition. In fact, Caillebotte carefully planned the painting to illustrate how people were dwarfed or surrounded by the cities industrial features. He made many preparatory studies of the figures and the bridge. Here you can see the way some of the Impressionists built a painting by placing daubs of bright color side by side. The golden leaves in the tree on the left stand out more vividly for being painted next to the blue sky.